The first #SFFpit Twitter pitching event for sci-fi and fantasy authors was a HUGE success! An hour before the event, I thought we might have as many as a dozen literary agents stopping by the hashtag to read pitches. Turns out, we had more than twice that: 26 agents from 20 different agencies by my count, not to mention several editors of small presses. Many of them were invited to participate by me or my agent, but a fair number turned up on their own. This is wonderful news, because it means that news of #SFFpit was flying around literary agent circles. 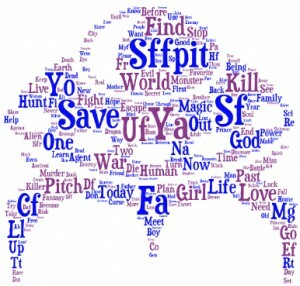 Then again, it might simply have been the beacon of SF/F writing talent that came to pitch their work. According to my hashtag analysis, there were about 530 authors making pitches. What a fantastic turnout! 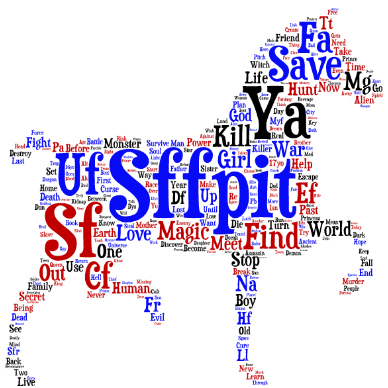 So, how do you know if you “won” #SFFpit? Here are a few of the ways. The first and most obvious way to win was to catch the eye of an agent during the contest yesterday. I wish I could tell you that every single one got a request from that dream agent, but this is the real world. Around 200 authors had a tweet favorited by one of the 20+ agents I tracked during the event. That’s less than half, and it’s skewed somewhat by two super-clicky agents (Rena Rossner and Jessica Sinsheim) who favorited 150 pitches between them. Only 79 authors, or 15%, got favorites from two or more agents. That’s about what I would expect, based on my previous analyses of Brenda Drake’s #PitMad. If this wasn’t you, don’t worry. Most of the agents who were participating are open to regular queries, which is how I found my agent. Another way to win: if your pitch was favorited by one of the editors who came #SFFpit. They represent small presses, for the most part, and generally a different path to publishing than going through an agent. I invited a few of these editors myself (like Emily Steele and Lorie Jones from Medallion Press, and McKelle George from Jolly Fish Press). Others, like World Weaver Press and CBay Books, showed up on their own. I don’t know much about them. If any editor favorited your pitch, good for you! It’s an invitation to submit. Like all invitations to authors, however, this is one to be evaluated carefully. Not all presses are created equal these days. Some have unreasonable contract terms, or provide little support for the author. Almost all of them won’t be cutting you a large advance. I recommend the forums at Absolute Write’s Water Cooler as your first stop for vetting small presses. Don’t be afraid to ask around among author friends. Do your homework. If it turns out that you’ve caught the attention of a great small/medium-sized press — like Carina Press, Medallion Media Group, or Jolly Fish Press, to name a few — then you’ve got some thinking to do. This could be a real path to publication. Here’s the big way to win at pitching contests like #SFFpit: meet and befriend other authors who write genre fiction. If you retweeted their pitches, if you followed them and were followed back, if you visited their blog and left a comment, you were a winner. Joining the the author community and making new friends is so important for success. Writer friends understand you in ways that non-writer friends never will. They know about the rejection, the waiting, and the angst that we all encounter on the road to publication. I encourage you now to make that a REAL friendship. Offer to become critique partners, or to guest post on one another’s blogs. Build something real out of this, and you were a big #SFFpit winner indeed. For new authors, our novels are like our babies. Our first born. Lovingly made, crafted, and cared for. We sometimes hesitate to put our novels out into the world — into queries or pitching contests or critiques — because we don’t want anyone to speak ill of them. We worry that they won’t be liked, and that will be hard to bear. If you put your work out there in a pitch, and tried to catch the attention of an agent or editor, call this a win. Especially if you were doing so for the first time. Odds are, you’re going to have to do this a lot. You’re going to face dozens of rejections and critiques before your book hits the shelf. You will need self-confidence to do that, and if you participated in #SFFpit, you’ve already got some. Keep working at it. This was the best pitching contest I’ve ever participated in. Somehow, some way, we managed to bring together a very talented group of aspiring SF/F writers. If reading those pitches gave you new ideas, or motivated you to get that book done, or inspired you to get even better, then #SFFpit was a huge win for you. Call this your trophy, bring it home, and GO WRITE SOMETHING!